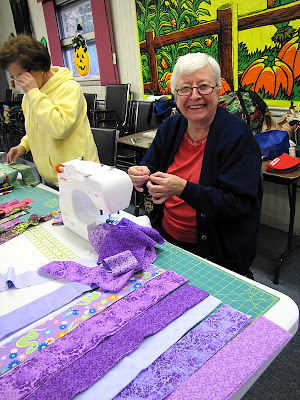 Canton Village Quilt Works | We're Off To The Races!! We're Off To The Races!! On Saturday our guild had a little workshop day. It was a fun one too! 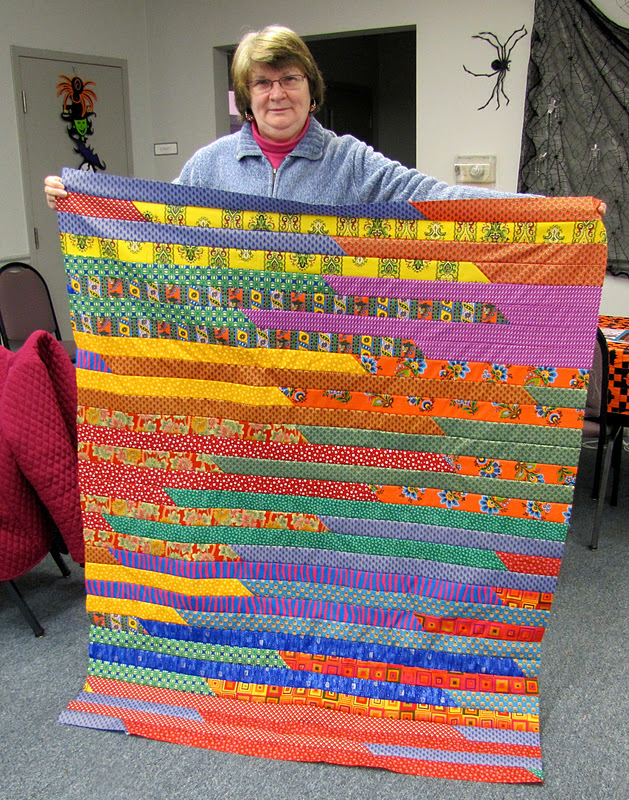 We all made Jelly Roll Race Quilts! We were off and running with our jelly rolls (2.5 inch strips) and we had prizes too for the first ones to finish. We all went home with a top, borders were the only things that still need to be applied. The day started off with a bang. My friend Justine went to town and joined all her strips and ended up with flags! Now to cut them apart. Roberta was very organized and very happy to be there. She is always smiling and delightful. Wanda was the over achiever in the group. She finished her top in just about 1.5 hours! 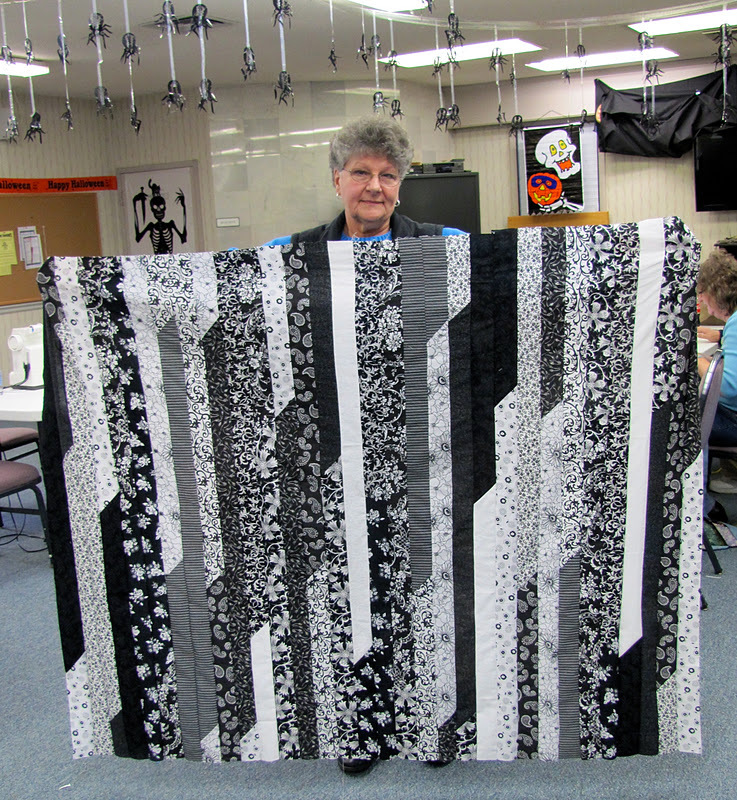 Her machine was humming along... Go Wanda!! Our fearless leaders Pam and Sue inspect Wanda's quilt to make sure that it is complete... Looks good! Justine did her quilt in all bright strips, fabulous! I kept chugging along (aerial view). Justine had the back part of mine going directly into her bag in hopes that she could take it home... no way, sorry Justine! Here is mine all done... for my son. Now for some stacked borders. Don't you just love it in black and white? You can see more of these beauties that were completed in this Flickr set. If you want to know how to make one of these little quickies, just click here for instructions and a video! 1. Come back here tomorrow for the Block #2 of the Blogger's Block of The Month. 2. This is the last day that all Westminster and Batik fabrics will be marked down to $7.95 per yard. Click here to start shopping.